Use of Freeway Shoulders for Travel — Guide for Planning, Evaluating, and Designing Part-Time Shoulder Use as a Traffic Management Strategy: Chapter 1. What is Part-time Shoulder Use? Chapter 1. What is Part-time Shoulder Use? Part-time shoulder use is a transportation system management and operation (TSM&O) strategy for addressing congestion and reliability issues within the transportation system. It is a strategy that may be used as part of a congestion management process (CMP). There are many forms of part-time shoulder use or “shoulder running”; however, they all involve use of the left or right shoulders of an existing roadway for temporary travel during certain hours of the day. Part-time shoulder use has primarily been used in locations where there is recurring congestion due to lack of peak period capacity through the corridor, particularly where other alternatives to peak period operations are infeasible or cost-prohibitive (at least in the near term). In such situations, TSM&O alternatives, including part-time shoulder use, may be most appropriate for cost- effectively reducing delays and improving travel-time reliability. 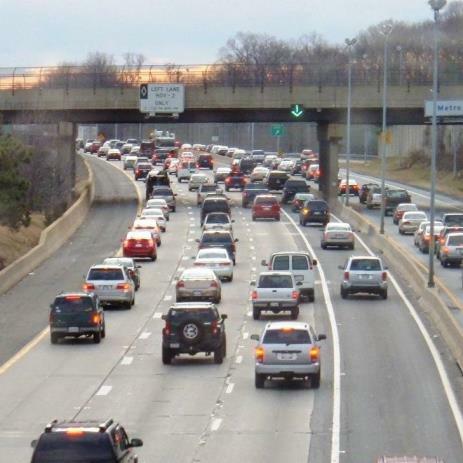 Part-time shoulder use is a form of Active Traffic Management (ATM) and modifies roadway conditions and controls—in this case the number of lanes—in response to forecast or observed traffic conditions. It may be used in combination with other ATM strategies, such as overhead lane control signs, dynamic speed limits, and queue warning. Converting a shoulder to a full time travel lane—known as shoulder elimination—is fundamentally different than using a shoulder on a part-time basis as an ATM strategy. This strategy should be used with much greater caution, and involves additional considerations not presented in this guide. Although part-time shoulder use can be a very cost-effective solution, it may not be an appropriate strategy where minimum geometric clearances, visibility, and pavement requirements cannot be met, or it may have an adverse impact on safety. Part-time shoulder use is primarily used on freeways. There are multiple examples of how highway agencies have used the shoulders of roadways to address congestion and reliability needs and to improve overall system performance. These options vary in terms of the location of the shoulder (left/right shoulder options) used, vehicle-use options [e.g., bus only, high-occupancy vehicle (HOV) only, all vehicles except trucks], operating schedule, and special speed controls. In all of these options, the use is “temporary” for part of the day, and the lane continues to operate as a refuge/shoulder when not being used for these travel purposes. This condition is referred to as “part-time shoulder use” throughout this guide. The decision to pursue the option of part-time shoulder use should be made as part of a comprehensive Performance-Based Practical Design (PBPD) assessment of design and TSM&O options for achieving the agency’s performance objectives for the facility design and operations. First the physical feasibility of part-time shoulder use should be evaluated to determine if it is a feasible option, and a region should decide if part-time shoulder use is consistent with its long-term transportation goals and objectives. Then, a preliminary assessment should be made to identify one or more design and operations concepts for evaluation. This assessment, conducted under the overall umbrella of a PBPD process, should assess the operational and safety effects of part-time shoulder use to ensure it is indeed a cost-effective means for achieving the agency’s performance objectives for the facility. Throughout this evaluation, key planning and environmental, maintenance, operations, design, and emergency responder stakeholders should be involved to ensure a successful outcome. Aside from their structural benefits for pavement and drainage, shoulders provide refuge for vehicles in emergency situations, access for first responders, and an additional recovery area for drivers trying to avoid conflicts in the adjoining travel lanes. The safety benefits of shoulders are documented in the AASHTO Highway Safety Manual and other studies. Because of these factors, the decision to use shoulders for travel should be carefully considered and limited in both its application and time of usage. The shoulder is used for travel only during those times of day when the adjoining lanes are likely to be heavily congested (e.g., during peak hours, when congestion is detected, or when general purpose lanes are closed for construction or incidents). When not needed as an additional travel lane, the shoulder will be restored to its original purpose as a “shoulder,” and the basic physical characteristics of the shoulder are retained and recognizable. The term “part-time” does not require that the use of shoulders as a TSM&O strategy is “short- term” and will be discontinued by some fixed date. Although part-time shoulder use may be used as an interim treatment while a conventional project (e.g., construction of additional lanes) awaits funding or completion, it may also be used indefinitely. This guidance does not address the “part-time” use of a shoulder in work zones during construction (e.g., as part of a lane shift or closure). The Manual on Uniform Traffic Control Devices (MUTCD) and agency-specific guidance on maintenance of traffic plans address such usages. Additionally, this guidance does not address the permanent, full-time usage of a shoulder as a travel lane. Such usage constitutes the “permanent elimination” of the shoulder and the creation of a new travel lane. This is a major design change and not a TSM&O strategy. Additionally, this guidance does not address the use of shoulders to remove slow-moving trucks from general purpose lanes on steep upgrades. This effectively converts the shoulder into a permanent truck-climbing lane. A handful of shoulders are open to slow moving trucks on rural and suburban freeways in the U.S. In lieu of a conventional add-a-lane capacity improvement. As an interim treatment while a conventional widening or expansion project works through the planning/design/construction process. Increase bus ridership by improving bus travel time and reliability. Provide short-term benefits for a minimal cost compared to ultimate solution. Mitigate the loss of general purpose lane capacity if a general purpose lane is converted to a managed lane such as an HOV lane. Same speed limit as other lanes (at posted speed limits). Lower speed limit than other lanes. Dynamic shoulder use for most vehicles based on need and real-time traffic conditions. Vehicle-use restrictions vary by facility, but static and dynamic shoulder use is typically open to all vehicles except trucks. This section summarizes key guidance presented throughout this document. It is intended to provide readers with a concise summary of key information presented in the remaining chapters of this document. The evaluation of part-time shoulder use as a strategy for relieving congestion in a corridor should begin at the regional level as part of a planning process. Practitioners should consider part-time shoulder use if it is consistent with a region’s long-range plan, and congestion management process (CMP). More complex part-time shoulder-use projects, such as dynamic shoulder lanes, should also be consistent with the regional intelligent transportation system (ITS) architecture. More viable candidates for part-time shoulder use over “unmanaged” corridors include corridors monitored by a traffic management center (TMC), supported by a Traffic Incident Management (TIM) program, and generally highly managed. The National Environmental Policy Act (NEPA) should determine if part-time shoulder use is the preferred solution for a corridor, and preliminary engineering activities determine specific operating conditions. If congestion reduction (or transit service improvements in the case of BOS) are desired and traditional improvements are not feasible, part-time shoulder use may be the right solution for a corridor, and a NEPA process should be initiated. Implementation of part-time shoulder use typically occurs within the existing paved roadway area and primarily has the potential to impact environmental categories related to traffic volume and speed such as air quality, greenhouse gas emissions, and noise. However, some part-time shoulder use projects involve widening the shoulder, which creates the potential for impacts to many other environmental categories such as water quality, plants, animals, and socio-economic elements. Part-time shoulder use projects often receive a categorical exclusion (CE). Is shoulder width adequate, or can it be widened? Is the shoulder pavement structural capacity adequate in terms of drainage and rideability? Is it feasible to provide supplemental emergency pull-off or refuge areas beyond the shoulder at reasonable intervals? Is a sufficiently long segment available, or is an acute bottleneck being relieved? If the answers to these questions determine part-time shoulder use is feasible, a specific operating scheme can be selected. Should the right or left shoulder be used? The right shoulder is used most often because it is usually wider than the left shoulder and thus easier to implement. Both shoulders should not be used. What vehicles will the shoulder be open to? 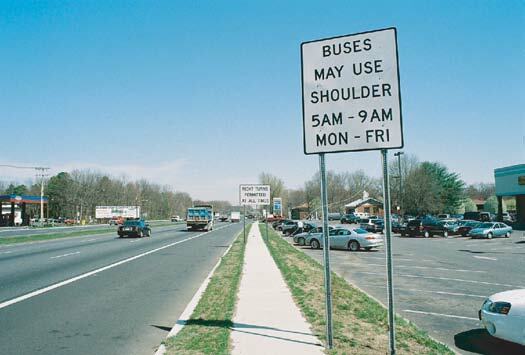 If the shoulder is open to more than buses, should it be a static shoulder lane (fixed hours of operation) or dynamic shoulder lane (variable hours in response to traffic conditions)? Will there be speed restrictions? The capacity of a shoulder used for travel depends on design features such as shoulder width, length of the segment used for travel, and speed limits. For example, I-66 in Virginia features a 12-foot wide shoulder lane with a two- to four-foot wide paved “shoulder” beyond it, overhead dynamic lane control signs, and the same observed capacity as adjacent general purpose lanes. I-93 in Massachusetts has shoulder lanes less than 12 feet wide, a one- to two-foot paved “shoulder” beyond the shoulder lane, limited dynamic signs, and generally older-style interchanges with more-constrained geometry than I-66. The shoulder on I-93 was observed to have only one-half to two-thirds the capacity of adjacent general purpose lanes. A simulation study found a “low quality” 10-foot-wide shoulder that is closed to trucks and only willing to be used by slightly more than half of drivers has a capacity of approximately 1,300 vehicles per hour, and a 12-foot-wide shoulder with “normal freeway lane design standards” that all drivers are willing to use has a capacity of approximately 1,650 vehicles per hour. When analyzing a potential part-time shoulder use project, capacities should be set by first determining the approximate geometric dimensions of shoulder elements and then choosing a capacity value observed or simulated on a similar facility noted above. Operations analysis of freeways is typically conducted with the procedures of the Highway Capacity Manual (HCM) or microsimulation. Both sets of tools can be adapted for analysis of part-time shoulder uses. The HCM does not provide for lane-by-lane analyses, so shoulders designated for part-time use must be combined with the general purpose lanes for the purpose of capacity analysis and the estimation of speed and delay. A proportional capacity reduction should be applied to all freeway lanes to account for the reduced capacity of the shoulder lane. Use of the FREEVAL software tool should be considered for part-time shoulder-uses projects encompassing multiple interchanges. Many microsimulation programs enable parameters to be adjusted on a per-lane basis, so capacity of the shoulder can be adjusted directly. Experience in the U.S. to date has not identified major safety issues with part-time bus, static, or dynamic shoulder use that led implementing agencies to discontinue part-time shoulder use due to poor safety performance. Before/after crash studies of part-time shoulder use in the U.S. and internationally have not consistently indicated whether part-time shoulder uses has a positive or negative effect on crash frequency. An analysis of existing crash data, including crash type, the time of crashes, and the location of crashes should be the basis of a safety analysis of potential part-time shoulder use. Part-time shoulder use would likely reduce congestion-related crashes occurring during the hours part-time shoulder use would operate. Crashes related to erratic driver behavior, driver confusion, or suboptimal geometry may increase with part-time shoulder use. Assessment of the safety impacts of part-time shoulder use on a given facility should begin with a review of three or more years of historical crash data. The review should consider the crash type, temporal factors (e.g., time of day, day of week), and location. 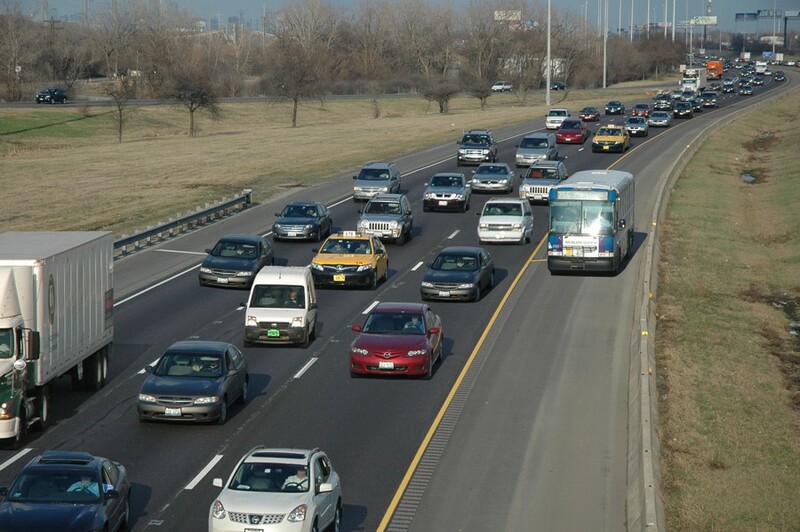 Congestion-related crashes, such as rear-ends occurring during times a shoulder would be open to travel, may potentially decrease with part-time shoulder use if congestion is reduced. Crashes related to erratic driver behavior or suboptimal geometry, such as run-off-road, fixed-object, or sideswipe crashes, may increase with part-time shoulder use. Crashes related to right-side ramp-freeway junctions may increase with part-time use of the right shoulder. The mere presence of crash types that may increase with part-time shoulder use should not prevent the application of part-time shoulder use, but a preponderance of those crash types indicates a given freeway may be a poor candidate for part-time shoulder use. As with all federal-funded or permitted actions, the National Environmental Policy Act (NEPA) applies. The environmental categories most likely to be affected by part-time shoulder use include air quality, greenhouse gas emissions, and noise. Given the variety of characteristics of shoulder use projects, generalizing the effect of shoulder use on air quality remains difficult. Shoulder use may reduce congestion, which is generally beneficial to air quality. Shoulder use also has the potential to increase traffic volume, which generally worsens air quality. There may also be no net effect on traffic characteristics that would affect air-quality pollution concentrations. Areas that do not meet, or previously did not meet, federal air quality standards are identified as “non-attainment” and “maintenance” areas, respectively. The Environmental Protection Agency (EPA) requires air quality analysis of federal transportation projects in these designated areas for the transportation-related pollutants—ozone, nitrogen dioxide, carbon monoxide, and particulate matter per the transportation conformity rule (3). Shoulder-use projects are typically federal projects because they require design exceptions. Projects in metropolitan non-attainment and maintenance areas must be incorporated into regional emissions analysis associated with the region’s Transportation Improvement Plan (TIP) and long-range plan (MTP). Transportation conformity rules also require the analysis of potential localized emissions impacts where applicable. Non-attainment and maintenance areas have standing transportation conformity procedures in place that address how projects are handled to assess for conformity status (exempt/non-exempt) and whether a project-level analysis is required. These procedures may assist in assessing individual part-time shoulder-lane projects. Is the shoulder only open to buses, or will other vehicles have access? In some states—currently California, Massachusetts, New York, and Washington—analysis of greenhouse gas (GhG) emissions is required for some transportation projects. Part-time shoulder- use projects in these states may require GhG analysis depending on the circumstances. Noise analysis measures the noise impact when the predicted noise level approaches or exceeds the Noise Abatement Criteria (NAC) in 23 CFR 772 or represents a substantial increase over existing noise levels. Per 23 CFR 772, noise analysis is required for all Federal or Federal-aid Highway Projects authorized under Title 23, United States Code that are categorized as Type I or Type II. 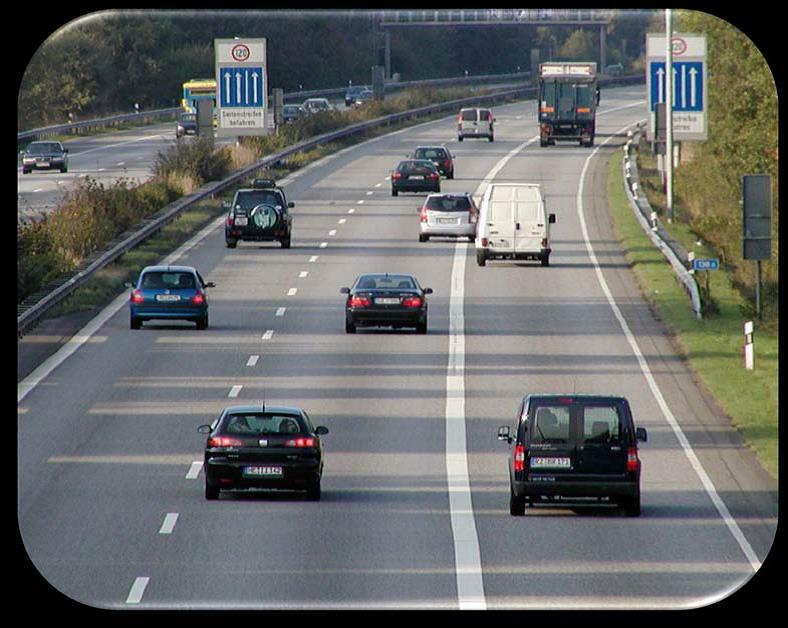 Type I projects include adding a travel lane such as during part-time shoulder use, and similar to air quality analysis, design exceptions required for part-time shoulder use will make these projects federal thus subject to 23 CFR 772. If part-time shoulder use does increase peak noise, and there are impacts associated with it, noise abatement must be considered and implemented if found to be feasible and reasonable. The likelihood of noise issues is greater with use of the right shoulder than with use of the left shoulder, since the right shoulder places traffic closer to noise receptors. Compared to traditional capacity-adding projects, part-time shoulder use projects typically have lower initial construction costs and higher operations and maintenance costs due to the ongoing management of the shoulder and any associated ITS equipment. For this reason, a life-cycle cost should be computed for any part-time shoulder use project under consideration. A 10-, 15-, or 20-year time horizon should be considered. Shorter horizons may be appropriate if part-time shoulder use is being implemented as a temporary measure until larger capacity-adding project such as widening is completed. Benefit cost ratios are useful for comparing part-time shoulder-use projects to other alternatives on a corridor and other projects in a region. FHWA’s TOPS-BC tool was developed specifically for TSM&O projects such as part-time shoulder use and is one means of conducting a benefit-cost ratio. Logical termini should be established during project scoping and preliminary engineering consistent with NEPA guidance. Part-time shoulder use can begin and end along basic segments or at ramps. If the beginning or end of a static or dynamic shoulder use segment falls along a basic freeway segment, then it would desirably be located such that it is highly visible and easily comprehended to approaching drivers. Horizontal curves, crest vertical curves, and overpasses may limit a driver’s visibility of a downstream roadway, and dropping any type of lane, including a shoulder open to part-time travel, within or immediately beyond these features should be avoided if possible. Likewise, dropping any type of lane in or immediately beyond an area with extensive, complex signing or other features contributing to high driver workload should be avoided, if possible. The desirable locations for lane drops are also desirable locations to begin shoulder use. Part-time shoulder use along basic freeway segments should include pavement markings at the beginning of the area designated for shoulder use that guide drivers from the adjacent general purpose lane onto the shoulder but also maintain continuity of the general purpose lane. Shoulder use ends along basic freeway segments are designed similar to shoulder use adds. A solid edge line is typically used to transition traffic from the shoulder back to the adjacent general purpose lane. Carrying part-time shoulder use through system interchanges is more complex due to conflicts with exiting and entering traffic. At major forks, the shoulder lane can be carried onto one of the forks. This is desirable if the ramps downstream of the fork have more lanes than the freeway approaching the fork. Georgia and Hawaii maintain static part-time shoulder use between (but not through) adjacent interchanges to create auxiliary lanes and mitigate the effects of closely-spaced entrance and exit ramps. In this case, lanes designated for shoulder use do not function as basic freeway lanes, and a drop onto a service interchange is necessary and inherent in the design. For shoulders designated for part-time travel, a width of 12 or more feet is generally preferred. Narrower shoulders may be adequate depending upon the type of vehicles using the part-time shoulder lane, the available lateral offset to obstructions beyond the pavement edge, and if speed restrictions will be used when the shoulder is open. If trucks are prohibited from using the shoulder, then widths as narrow as 10 feet may be adequate. Shoulders less than 10 feet wide are not recommended for part-time shoulder use. A 10-foot shoulder may be inadequate for part-time shoulder use if the lateral offset to obstructions is less than 1.5 feet or a high volume of larger vehicles such as buses is anticipated. Opening the shoulder only when congestion is present and reducing the speed limit when the shoulder is open will likely to improve the safety of a narrow shoulder designated for part-time use. Shoulders less than 12 feet wide will typically require a design exception if they are designated for part-time shoulder use. If an entire roadway is repurposed, and general purpose lanes are reduced to less than 12 feet wide to accommodate part-time shoulder use (for any shoulder width), a design exception is also required. It is desirable to leave several feet of pavement beyond the portion of the shoulder designated for part-time shoulder use to decrease the likelihood of vehicles departing the roadway and decrease pavement maintenance needs. Part-time shoulder use will require a design exception, since the remaining paved shoulder (beyond the portion of the shoulder designated for part-time shoulder use) will not meet the minimum width requirements. Lateral offset to obstruction is the distance from the edge of the traveled way to the nearest physical obstruction such as a median barrier, guard rail, bridge support, or bridge rail. The lateral offset between the edge of a lane designated for part-time shoulder use and an obstruction should be at least 1.5 feet. In practice, states have relocated guardrails and other obstructions (sign and lighting structures), and obtained design exceptions for segments adjacent to bridge rails/barriers and abutments or other concrete barrier where lateral offset to obstruction is less than 1.5 feet. Many bridges have narrower shoulders than the approach roadways. The minimum width of a bridge shoulder that could be designated for part-time shoulder use is 11.5 feet. This dimension provides 10 feet of the shoulder as an effective part-time lane and 1.5 feet of the shoulder as an effective lateral offset to obstructions. It is not necessary for a shoulder designated for part-time use on a bridge to be the same width as a shoulder designated for part-time use on the approaching roadway; however, it does need to be 11.5 or more feet wide. In these circumstances, design exceptions may be needed for shoulder widths less than 12 feet and/or if the lateral offset to obstruction dimension is not met. On the inside of horizontal curves, a shoulder designated for part-time use will be closer to guardrails or median barriers if they are present. This may reduce sight distance, and it may reduce it below AASHTO minimum design values. If this occurs, it may be appropriate to relocate the barrier causing the sight-distance obstruction, impose speed restrictions, or obtain a design exception. Cross slopes on shoulders are sometimes greater than adjacent general purpose lanes to facilitate drainage, creating potential issues for part-time shoulder use. An agency may need to round a grade break between the travel lane and the shoulder or reduce shoulder cross slope by adding pavement on top of existing pavement to modify the cross slope. Prior to implementing part-time shoulder use, agencies typically field measure the height of bridges along a route, and any substandard vertical clearances dictate vehicle restrictions. Chapter 8 describes how to maintain part-time shoulder use through on- and off-ramps. Part-time shoulder use may be implemented on freeways with taper-style or parallel-style ramps. Maintaining part-time shoulder use through a two-lane entrance or exit ramp is more challenging, and is not possible in some cases depending on the design details of the ramp- freeway junction. Ramp meters are effective at mitigating potential conflicts in merge areas because they break up platoons of ramp traffic and make it easier for traffic using the shoulder to cross the ramp taper or enter the speed change lane. This benefit occurs even with BOS operation if on-ramps have meters, the meters should be active when the shoulder is in use. Providing periodic emergency refuge spaces for disabled vehicles beyond the shoulder is highly desirable with part-time shoulder use. Sometimes, gore areas or ramp shoulders at entrances and exits provide a refuge space large enough to store a vehicle. When this is not the case, or when ramp spacing exceeds a half-mile, emergency turnouts should be constructed desirably at half- mile intervals. Turnouts should be long enough and 16-or-more feet wide so a vehicle with poor control and in the process of breaking down can enter it and be out of the shoulder. They should also be long enough to enable a tow truck to park and load a broken-down vehicle. If turnouts cannot be constructed, such as on bridges or other constrained areas, part-time shoulder use can still be implemented, but there is a greater probability the shoulder will be blocked by disabled vehicles. Dynamic lane control signs should be given greater consideration on these facilities to enable closure of the shoulder in response to a disabled vehicle. Turnouts have fewer benefits and are generally not constructed on BOS facilities because buses can reenter a general purpose lane to pass a disabled vehicle without greatly affecting traffic flow on the freeway or bus travel time. Similar to freeways, arterial shoulder widths of 10 or 11 feet are adequate for part-time use on an open section for a low volume of buses at lower, congested speeds, and a 12-foot shoulder is desirable for part-time shoulder use. A 10-foot lane should not be used for part-time travel if the lateral offset to obstructions is less than the 1.5-foot AASHTO standard or if curbs are present. If curbs are present, then vehicles should be able to remain entirely in the shoulder and maintain a 1.5-foot separation between right side tires and the face of curb. The 2009 MUTCD(5) does not contain signs specifically intended for part-time shoulder use, although signs developed by agencies should be compliant with the MUTCD. The next edition of the MUTCD is expected to include signs for shoulder use. Similar to exit ramps on a freeway, a series of signs provided in advance of a pull-off and at the pull-off itself is recommended to increase driver awareness of its existence. Signing on roadways with BOS operation is generally limited to static, ground mounted signs. Such signs should be installed along a roadway with BOS operation at regular intervals and near on- and off-ramps. There is typically no need for signs specifying hours of operation. Along a route, buses sometimes must merge back into a travel lane to avoid a narrow section of shoulder, often on or beneath a bridge. Black on yellow warning signs should be used if this is necessary. If dynamic signs are used, then they should, at a minimum, include dynamic lane controls indicating that the shoulder lane is currently closed, open, or will soon be transitioning to be closed. Striping can create parallel or taper-style merges and diverges. The 2009 MUTCD limits use of diamond pavement marking symbols to HOV lanes, and they should not be used on shoulders open only to buses. If part-time shoulder use projects make use of federal funding or require federal action, then they require NEPA evaluations. Most to date have received a categorical exclusion (CE) because they are typically implemented within the existing ROW and largely within the existing paved surface. Reduced speeds, achieved through lower speed limits during periods of part-time shoulder use coinciding with congestion. Annual average daily traffic (AADT) in ranges where Highway Safety Manual (HSM) analysis (summarized in CHAPTER 4) predicts a reduction in crashes with narrowing of the shoulder and addition of a lane. Prohibition of trucks in shoulder lanes. Enhanced monitoring of the facility with intelligent transportation systems (ITS) and/or patrol vehicles. The specific requirements of design exception requests vary by state. Design exceptions are typically submitted to and approved by FHWA Division Offices. Part-time shoulder use may have a relatively short implementation timeframe compared to conventional projects, so a design exception request should be prepared and submitted to FHWA as early as possible in the project development process. Most part-time shoulder use projects that have recently been implemented or are currently in the planning process are long-term implementations. Temporary approval is not recommended, since it may create the need for re-approval. Most part-time shoulder use projects have not required experimental traffic control devices. However, some more-complex part-time shoulder use projects, such as those with other ATM elements or extensive use of dynamic lane control signs, may require a request for experimentation. Chapter 8 describes the items that should be included in a request. As soon as a state DOT determines part-time shoulder use is desirable and feasible, they should reach out to stakeholders including planning, operations, design, maintenance, and executive leadership staff within a DOT; law enforcement; emergency responders; bus operators (particularly if the shoulder lane is only open to buses); MPO staff; and FHWA Division Office staff. Most agencies that have successfully implemented part-time shoulder use have formed working groups to ensure the needs of all stakeholders are incorporated into the concept of operations. Stakeholder involvement and education—assuming that some stakeholders may not be aware of the benefits and potential issues associated with part-time shoulder use—is an ongoing process, and working groups should continue to meet during the early years of part-time shoulder use. Engaging executive leadership early is critical because policies may need to change and laws potentially prohibiting driving on the shoulder may need to be interpreted or changed. Successful implementation of the first part-time shoulder use project in a metropolitan area includes explicit and proactive outreach and education to the general public and should be undertaken consistent with state public information guidance. Maintenance of the shoulder is more similar to maintenance of general purpose lanes. Part-time shoulder use is typically implemented on some of the highest volume and most congested freeways in a region. These roadways typically have incident management plans and infrastructure in place, and it can be adapted for part-time shoulder use. Emergency turnouts, service patrols, and CCTV are typically implemented during part- time shoulder use. On BOS facilities, shoulders can still be used by police to pull vehicles over. A lane designated for static or dynamic part-time shoulder use should be inspected in entirety before each opening by “sweeping” (driving) the length of the facility or viewing CCTV if there is full camera coverage of the facility. Although expert systems can electronically, rather than manually, sweep a facility, it is still necessary to have incident response vehicles on standby in the event that debris or disabled vehicles are identified and need to be cleared. Currently, no facilities in the U.S. use a fully-automated process to open and close the shoulder without a human making the final decision. In recent years, part-time shoulder use has emerged as a cost-effective way to help alleviate both recurring and non-recurring congestion, exploiting limited improvements to the existing infrastructure. The earliest application of part-time shoulder use launched in the mid-1970s on Seattle’s SR 520 as a means to help remediate peak-hour congestion by letting HOVs jump a queue approaching a bridge leading to the city center. Since then, the range of applications for part-time shoulder use has grown to cover a wide variety of strategies and has seen implementation in more than 16 states. These applications, which are highlighted in the Appendix, often form in an ad-hoc manner, and there has been little consistency among applications to date. For example, some applications use the left shoulder and others use the right, some employ changeable message signs and some employ static displays. Strategies have been adapted to best fit the specific conditions of the corridor. One common theme throughout, however, has been the complexity of the project development processes necessary to implement part-time shoulder use. Coordination across multiple stakeholder groups, including state DOTs, state and local government officials, transit agencies (if applicable), MPOs, enforcement entities, and various safety and emergency response stakeholder groups is essential for successful implementation. Figure 1 illustrates states that have employed part-time shoulder uses. Figure 1. Map. Part-time shoulder use locations in US, 2015. The remainder of this section highlights trends and applications of part-time shoulder use, both domestic and international. Descriptions of the several part-time shoulder use locations and a complete list of known locations in the United States are located in the Appendix. Additional information on BOS shoulder use in these states is included in the Appendix. BOS operation is primarily used on freeways, but is also used on arterials in several states. Figures 2 through 4 show BOS facilities. Figure 2. Photo. Bus-on-shoulder operations in Minneapolis-St. Paul. Figure 3. Photo. Bus-on-shoulder operations on the left-shoulder in Chicago. Figure 4. Photo. Static Bus-on-shoulder message sign on US 9 arterial in Old Bridge, New Jersey. All of these applications are on freeways. Additional information on static part-time shoulder use in these states is included in the Appendix. Figures 5 through 7 show static part-time shoulder use, some of which implement dynamic lane control signs. The specific facility shown in Figure 5—I-66—has since been converted to dynamic part-time shoulder use, although other static part-time shoulder use facilities remain in Virginia. Figure 6. Photo. 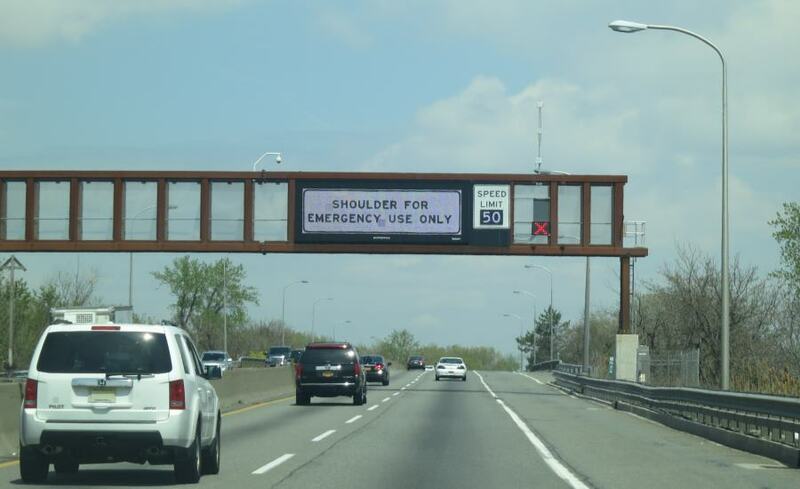 Static part-time shoulder use on New Jersey Turnpike Newark Bay Extension with variable speed limit and changeable message sign. Figure 7. Photo. Part-time shoulder use in Germany. Rather than limit shoulder running to periods of estimated recurring congestion, dynamic part-time shoulder use allows for general purpose traffic to temporarily use the shoulder as a travel lane as needed based on real-time traffic conditions. Through ITS equipment, a Traffic Management Center (TMC) can monitor conditions on the corridor and open the shoulder for use as congestion arises or in anticipation of increased traffic (e.g., special event or emergency scenario). 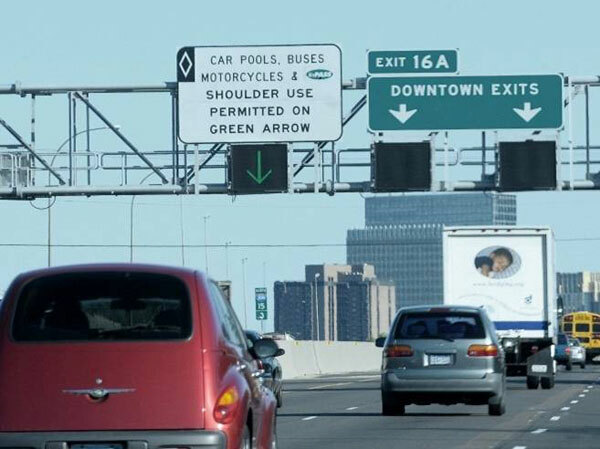 Dynamic signs actively inform motorists when the shoulder is open for use. Variants of this strategy have employed dynamic part-time shoulder use exclusively for (HOV) during peak periods to incentivize carpooling; these applications can also operate as HOT lanes, allowing single-occupant vehicles to utilize the shoulder for a fee based on traffic conditions. 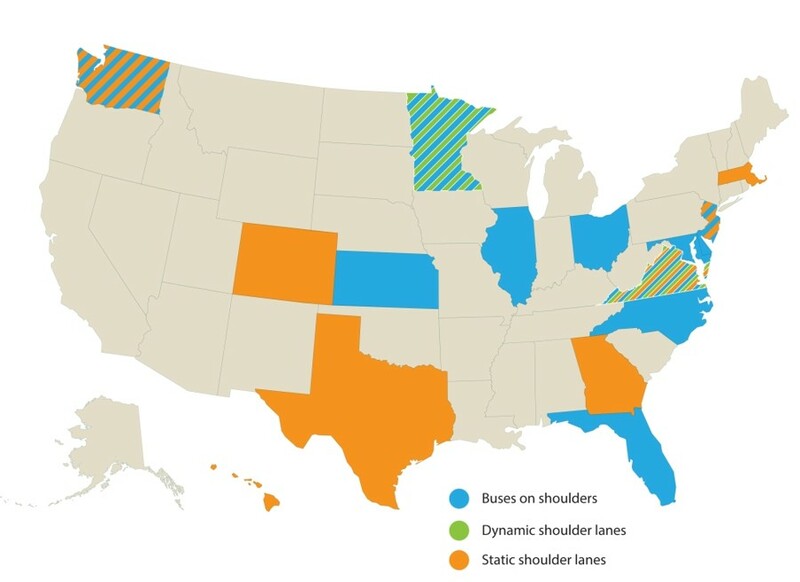 Currently there are two known dynamic part-time shoulder use installations in the US: one on I-35W in Minneapolis, and one on I-66 in Virginia that was converted from static part-time shoulder use in 2015. However, several states—including California, New Jersey, and Michigan—are in the process of planning dynamic part-time shoulder use. Figure 8 shows dynamic part-time shoulder use in Minneapolis. Figure 8. Photo. 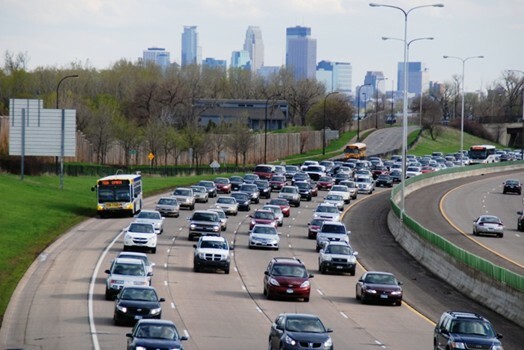 High-occupancy-toll part-time shoulder use in Minneapolis-St. Paul. Massachusetts implemented part-time shoulder use on a portion of I-95/SR 128 in 1985. A portion of this facility has since been widened—effectively replacing the shoulder with a full-time general purpose lane—and part-time shoulder use was discontinued on this segment. Widening of the remaining section of I-95 is under design, and upon completion, part-time shoulder use will be eliminated from I-95. Maryland allows buses to use the shoulder on a portion of US 29 to bypass queues at signalized intersections. The majority of intersections have been replaced with at-grade interchanges, and part-time shoulder use has been discontinued on the portions of US 29 that no longer have signals. Georgia and Hawaii do not carry part-time shoulder use through interchanges. When open, lanes designated for static part-time shoulder use function as auxiliary lanes between entrance and exit ramps. New Jersey is currently utilizing static part-time shoulder use on the New Jersey Turnpike Newark Bay Extension portion of I-78 to mitigate the closure of an adjacent freeway—the Pulaski Skyway—for reconstruction. The part-time shoulder use will be discontinued when the Pulaski Skyway reopens.